All movies go through a lot of changes before they hit the screen. There are rewrites, recastings, edits, studio notes—but one of the biggest changes that the upcoming scifi film Passengers went through is when the most famous and recognizable actress on the planet, Jennifer Lawrence, decided to join the project. These are the questions Chris Pratt’s character, Jim Preston, has to deal with at the start of Passengers, as he’s one of 5,000 people who paid a company called Homestead to fly to a planet, Homestead Two, to start a new life. The trip takes 120 years but he mistakenly wakes up 90 years too early and is not able to go back to sleep. He’s isolated, just as Spaihts originally conceived. And yet, that’s not what the movie ends up really being about, and that’s in large part because of Lawrence. However, Spaihts believes the cuts and changes made to highlight Lawrence’s character ultimately helped the film. With Lawrence as star, though, the isolation became secondary to what are actually much more interesting questions: the ideas of love, relationships, secrets, and lies, and what it means to live a full life. But it’s far from the only thing. Passengers gets into some heavy, messed-up, spoilery stuff, and blends lots of genres in an attempt to stand apart from traditional Hollywood fare. Balance also came in the more science fiction elements. The entire concept requires many leaps in terms of the actual science or logic and, to cover that, the movie never mentions a year. 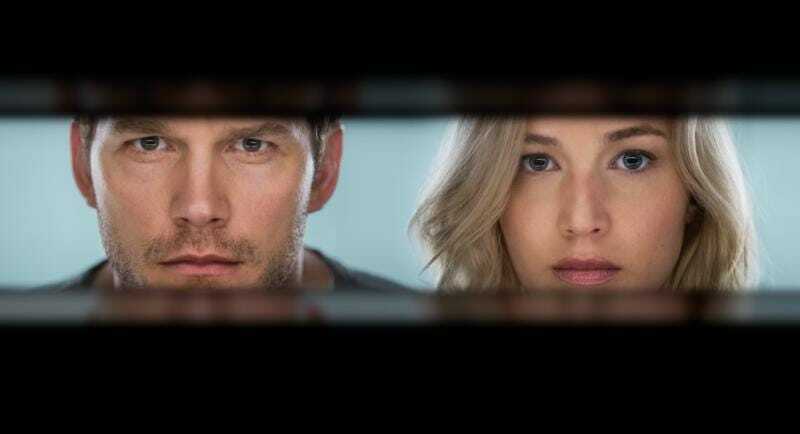 Passengers opens December 21. Check back for our review.